Other than size what is he missing. Has he ever been hurt from taking a bone crushing hit? Smaller players are faster and harder more elusive. He isn't on the roster to be a physical force. From what I have seen since being drafted, he seems to prove everyone wrong. Last years scoring race winner was what 5'8. So based on height we have a 6'7 dman that plays like he is 5'2, and a 5'8 forward that plays like he is 6'7. Height doesn't mean anything unless it is a tallest person competition. The kid will either make it or not based on his talent level not height. Since you are wondering you might like to look up the history of another Calgary Flame. He was even smaller than JH. Don't get me wrong, I am not saying JH is the next coming of Theo, but JH has the skillset. The drive and heart are to be determined yet. If you can, tune in to the Canucks Flames game tonight. JH and Bill Arnold are in the lineup. Johnny's been recently measured since his signing. He's listed currently at 5'9 and 160 lbs. He's an inch taller than Martin St. Louis, and stands at the same height as Mike Cammalleri. Here he is standing beside Bill Arnold who is 6'0 tall. He's not that much shorter or smaller. Patrick Kane is one inch taller (he's listed as 5'11 but we all know that's a BS padded stat, look at various pics around the net) and was 8 lbs heavier in his rookie year. I think that's a little overzealous to assume a 50 goal mark. It was done once in the Flames history. Lets temper our expectations a little. This article is from last year but it explains the rule pertaining to sending Gaudreau, Arnold, Agostino and Van Brabant down to the Heat, and why they are not ineligible. I had not seen your post and just replied to the KB post.. Nothing wrong with yours at all, no need to compare the 2 good posts and grade which is better. Guys, Kyle came in peace so don't get defensive. He & I seldom see eye to eye on the Flyers board but he seems to want Gaudreau to succeed. No defensive stance taken. Just giving some updated info on the kid. The "experts" are still spewing height and weight stats from 3 years ago, and unfortunately most people are getting their info from those sources. Not the first time the "experts" have gotten it wrong. Gaudreau has the tools to be a star in the NHL. More so than any other Flames prospect. That includes Monahan. But his size is a significant obstacle to overcome. Sure, there are some players that have overcome the size issue. But few of them are as tiny as Gaudreau, and there are way more guys that didn't succeed that aren't being talked about. Until Gaudreau proves that he can play at this level there will be plenty of sceptics. Let's hope he proves them wrong. Personally I think he will. He has the right maturity, attitude, and enough skills to overcome his size. I really hope that Gaudreau can transition smoothly to the NHL and be a top player for the Flames, but I am also realistic that it is going to be an uphill battle for him and I know success isn't going to come over night. 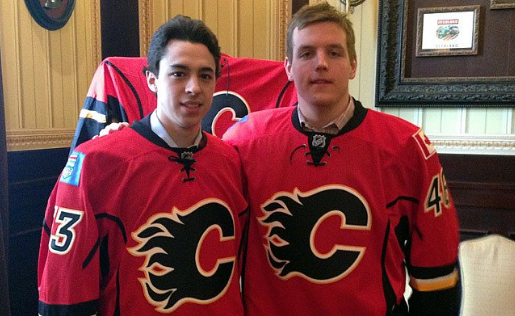 Welcome to the Flames Johnny Hockey. You have made it to the NHL, after an amazing season in the NCAA. Play your game and forget about all the people saying how small guys will have trouble making it. Enjoy the experience against one of the Flames' biggest rivals. Get used to the training regimen this summer so you can add those pounds you need. Get stronger so you can play at the higher level pro hockey brings. Don't get down if you don't immediately make the team. Hope you are here to stay. Exactly. That was my point. As 52 said, I come in peace (lol). Hey, at least he's off to a good start. He's getting pushed off the puck easily, but a goal is a goal. That has to feel good in your first and only NHL game of the season. Great picture! The first of many I think. I think the thing I was most impressed with was his vision. He seemed to be able to find the open man with regularity. Hopefully he can put on 10-15 lbs over the summer. There were a couple times he found passing lanes I didn't even see from the TV view. I liked watching him play, especially behind the net. I also like Arnold. I hope Johnny relishes his first goal, you only get one. Looking forward to next year already. Go Flames Go!